Amethyst Quantum Pads come in the same sizes as the Richway Biomats: King, Queen, Single and Professional. You place them over your Biomat to add another source of therapy to work in synergy with the BIomat. The Quantum Pad has eighteen substances that help connect you to quantum energy. These 18 special substances take on strong negative electricity, so they play a role in bringing the voltage in the body's cell membrane to normalcy. These 18 kinds of substances are organic compounds made from plant seeds which emit strong far infrared light. Once the voltage in a cell becomes normalized, the cell suddenly begins detoxification. Meanwhile, a nerve cell is sent to stop the delivery of the pain signal, alleviating pain. When scientists learned to split the atom, they realized there was a whole world inside the atom and they called it the sub-atomic level. There they found the quanta (plural quantum) which is an indivisible particle of matter. What happens inside this quantum field is mind boggling. Matter can convert to energy and energy can convert to matter. The intention of the observer changes and creates how the quantum behave. At the subatomic level, we can't observe something without changing it. When you access the world at the sub-atomic level, your intention creates reality. Quantum Energy Healing accepts this concept and defines quantum energy as one of these vibrational energy fields no one can see and that we can use this energy to heal the human body. Both the quantum energy layer and the tourmaline layer maintain your health by improving blood circulation. increasing detoxification and boosting your immune system through the use of far infrared rays which enhance resistance against viruses and bacteria. 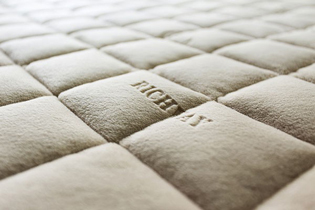 Richway's Quantum Pad reduces Beta waves, created by highly stressful times, while increasing Alpha waves, which create a relaxed state, giving you deep sleep and more focus. The quantum energy layer reduces formaldehyde and ammonia, which are harmful gases, and helps in cases of pneumonia. The quantum pad's antibiotic function rids the body of these gases by 99.9%. The Quantum Pad's, hypoallergenic microfiber fabric reduces heat loss, keeping you healthy and free from allergic dyes found in most synthetics. Its high density and durable 3D mesh material allows great air permeability. It also aids the passage of far infrared rays when used with the Biomat. The microfiber cover is machine washable and light, making it easy to wash. The 3D mesh distributes your body weight and pressure points are eliminated.